I love it whenI literally have to mound a meal onto my plate, piling on the pieces, trying to stop stray pieces of steak or carrot from rolling onto the bench because the plate can not contain the deliciousness. Admittedly, my plate is not large, and the food is mainly vegetables, but despite this it makes the meal feel generous. The only problem with this is that mounds of food don’t photograph well. I’m thinking that maybe chefs are onto something with their minimalist presentation – it makes the food look better. 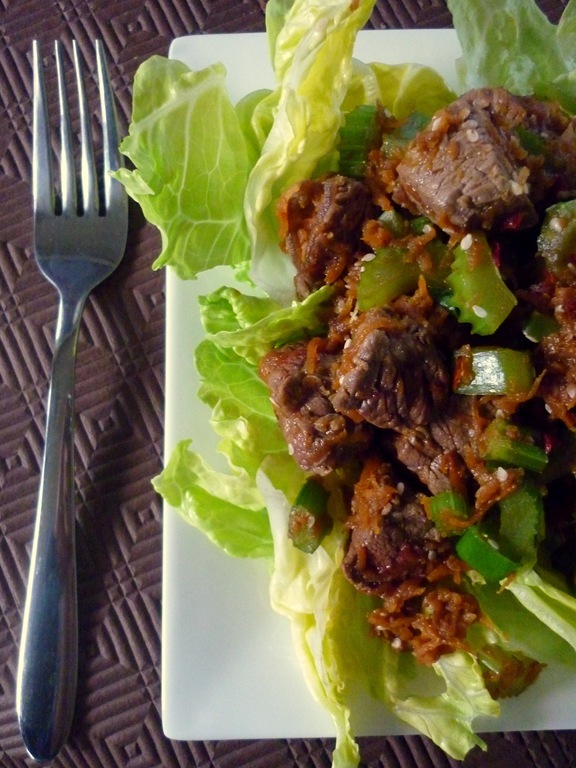 Tonight’s Korean steak is meant to be served in lettuce cups. I failed at making the lettuce cups. No matter how carefully I tried to separate the lettuce leaves, they split into pieces. That’s why the recipe turned into Korean steak on a heap of lettuce instead of being daintily spooned into delicate bowls of lettuce. It’s not attractive but it tastes good. Celery and carrots are quickly cooked in a fry pan with a little water and then marinated steak is added, followed by spring onion and sesame seeds. The marinade is sweet, spicy & salty with soy, garlic, ginger, sugar, cayenne pepper and sesame oil. Serving the cooked meat and vegetables on top of lettuce was a refreshing, summery change from rice and something I haven’t tried before but definitely will again. 6. Serve in lettuce leaf cups (good luck) or on a pile of shredded lettuce. Enjoy.